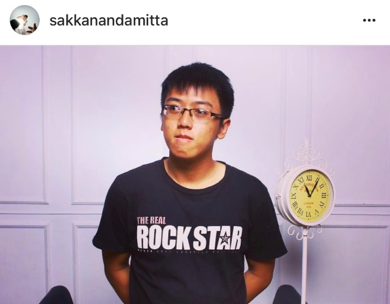 Sakkananda Mitta, was born on April 28, 1995. This youngster is one of Communication Department Alumni. Right now, he works for PT. GlobalJet E-commerce as a Business Consultant in Alibaba.com. He shared his experience as a college student with us. As a student, he often had some difficulties in his college life, especially from the tasks and lecturers. However, he agrees that college places learn about how to be an adult. In Binus University, he learns about discipline, friendship and how his lecturers push him into someone better. When he was in college, Sakkananda becomes an Editor in Chief for Gema Dhammavaddhana magazine. It’s a magazine forDhammavaddhana UKM. Even though he has no idea on how to produce a magazine, again he tries to push himself to learn about everything. In college, you are free to learn anything you want! He believes, three years become an Editor in Chief for a spiritual magazine, also teaches him to understand more about his self. One thing that he always has faith in “if you got the chance and you believe you can do that, take it!” it will lead you to something good. Campus life was hard and tiring, but if you always put your best effort, you will gain something great. Graduated with GPA 3,69 was not the end of everything. In contrast, that was the beginning. Right now, as a Business Consultant, he still needs to learn more to be a better professional in the future. However, he’s lucky enough, because his education background was in-line with his career. So, he can practice everything he learned in college. To sums up our meeting, he gave a message to other students, always do everything with spirit!